While residential solar has been growing steadily, commercial solar hasn’t grown quite as much. However, new projections state that commercial solar installations are expected to increase 40 percent over the total commercial solar installations from 2014. The 2015 Solar Investment Index survey commissioned by financial services firm Wiser Capital shows commercial solar is on the up and up. Over 60 percent of the corporate investors who were surveyed said they plan to invest in solar, and are making a priority within the next five years. Another 20 percent said they’ve already invested in solar so far this year, which equals a total of 83 percent of investors expressing “strong interest” in going solar, according to Greentech Media. 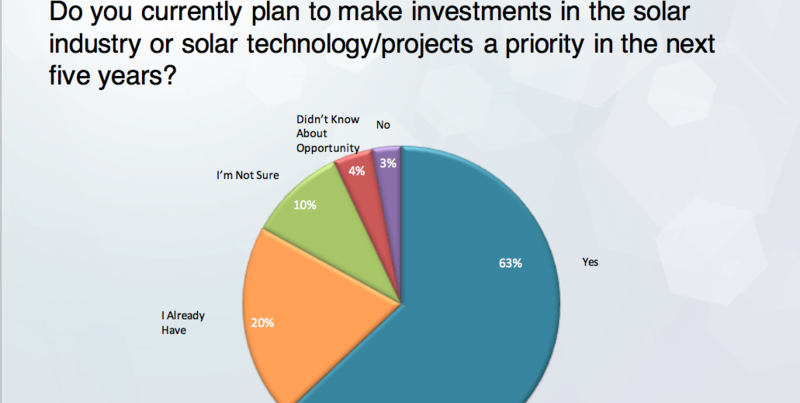 More highlights from the survey: a third of investors said they’ll invest in solar for the first time this year, and around another third said it’ll be their first time investing in solar once they do within the next five years. So why are companies suddenly investing in solar? Part of the reason lies in the expectation of strong returns. For 63 percent of the corporate investors surveyed, that was an essential driver. There’s also a general feeling that solar is becoming more and more mainstream, and with it a confidence that an investment in solar will pay off big. Secondly, there’s “market leadership,” or giant companies that are leading the way in embracing solar. Apple is building its own solar farm, while Google and Tesla are also getting on the solar bandwagon. Of those surveyed, 46 percent of investors pointed out this corporate activity as “inspiration” for investing in solar themselves. And even more heartening was the most common response as to why they would invest in solar: “support a cleaner energy future”. As investors are becoming more familiar and comfortable with solar, they’re more interested in creating a clean energy future. They’re also more confident in market fundamentals, with a desire to invest dollars that go towards making money and doing something to improve the environment. That said, there have been obstacles to commercial investors getting into solar. While almost half of those surveyed said there’s a lack of industry standardization, other issues cited were policies like net metering and the challenges of assessing solar’s risks. If they had better tools to assess risks, 69 percent said they would be more likely to invest this year. Likewise, without a partner, nearly one in three investors said there were difficulties trying to find financing for their own solar projects — over half that if it was easier to find partners to invest with, they’d go for solar. Overall, it seems as though investors in general are more comfortable with the idea of solar. But the problems that plague the industry, like standardization and policies, mean that there needs to be some work done focusing on financial modeling services and risk-rating platforms so investors know what they’re getting into, and are thus more likely to invest. Are you investing in solar? Do you know of smaller companies that are? Tell us in the comments!